It's pretty easy for most people to see the negative consequences of another person's behavior. As teachers we observe these behaviors every day and can't understand why students continue to choose behaviors that cause them problems even after we have explained the many negative consequences of their actions. Communication with students is the most powerful intervention teachers have. So how do we maximize the impact that our conversations with students have? By studying conversations, between people that result in changed behavior, we can identify elements that moved the conversation in a beneficial direction. Studies indicate that successful conversations of this nature follow a general sequence and that specific types of interactions are more appropriate at different times of the sequence. By having a general plan of action (heuristic) and knowing possible kinds of interactions our communications may have a stronger impact. Even so, there are other elements that must be in place. Change is hard. It takes time, is not comfortable, requires risk, can cause failure, and takes effort. Conversation can provide support but each individual must enact new ideas themselves to create behaviors they consider more powerful. Implementation and adjustment as necessary until success is achieved. Mr. Brown had just finished saying that the information he was about to present was very important and everyone needed to record it in his or her journal for future reference. No sooner had he finished and started to write on the board that he heard giggling at the back of the room. He turned around to see Sarah and Jen giggling uncontrollably and Sarah getting back into her seat. He moved to the back of the room and quietly told the girls they were almost out of time, that they needed to get started and asked them to talk to him after class. He finished putting the rest of the information on the board and the class finished without further incident. He wondered what the heck the girls were up to and what they were trying to do. He certainly did not want future trouble with them or others in the class. He wondered what he needed to do to insure that this incident didn't lead to more interruptions. He decided to talk to the girls and ask for an explanation. When class was over he asked the girls to explain what happened. (Collect reliable information) Sarah explained that she didn't have a pencil to write the notes and asked Jen for one. Jen agreed and when Sarah reached for it she fell off her chair and broke the pencil. Both girls said they couldn't help themselves and they just lost it. Mr. Brown used this information, what he knew about the girls from past experiences, and the look on their faces to conclude that the information he collected was probably accurate and they were not trying to hide another agenda from him. Still he wasn't sure he could let the girls go without worrying about them coming to class prepared, being careful to avoid accidents, cooperating in class, and learning. What he wanted was a commitment for appropriate behavior when the two were together. He wasn't sure if he needed a commitment to change" with plan, and implementation of a plan, or simply an assurance that this was an unusual occurrence that most likely wouldn't happen again. Therefore, he asked the girls if they thought something like this would happen again. The girls assured him that it wouldn't. Sarah said she will remember to bring a pen and that it was just an accident. Mr. Brown again considered what he knew about the girls and their present mannerisms to decide that he was getting a solid commitment and believed they had the desire and knowledge to implement it. He thanked them for talking and said they could go to recess. This is an example of how a problem solving heuristic was used for what turned out to be, not much of a problem. The entire problem solving conversation was concluded in seconds. Girls talk and Mr. Brown Listens while looking into each girl's eyes. Mr. Brown, "Probably not going to happen again?" Both girls emphatically shake their head no and say, "No, Mr. Brown." Mr. Brown, "Okay go to recess." Obviously not every problem solving conversation will be that short or have students that are so motivated and have the knowledge and social skills to succeed. Some conversations may go on for days, weeks, or months. There may be misinformation given, agendas hidden for weeks, interventions begun that become unsuccessful due to lack of skill and or motivation. There may times when a student is so uncooperative that we feel we must resort to imposing logical consequences or even punishment. While those interventions may be necessary we should remember that extrinsic interventions seldom lead to permanent positive changes in behavior and self-discipline. Therefore it is imperative that we keep the conversation going to support the development of knowledge, skill, and motivation for lasting change. A strategy is to talk through each of these steps to help students set and attain goals for self-improvement. While it seems simple. We must remember that many times students have been honing non-conventional behaviors for many years to gain control over their lives. As a result those behaviors have become a part of their intellectual, emotional, and biophysical physiology. This can create high resistance to change. It takes a calm, persistent, honest, and insightful educator to empower students to choose and achieve appropriate goals to meet their needs in positive ways. The first step is to interact to collect reliable information that identifies and explains the person's situation. By being a good listener and exhibiting a caring attitude a positive rapport is created with the student. Over time as positive interactions continually demonstrate a safe helping relationship the student will begin to trust that s/he can share accurate personal information. Body language can help or hinder the communication. Sit at eye level, make eye contact (if appropriate) lean forward, use open body language, smile, use good tonality, touch (if appropriate), nod and bob. The amount of time you are willing to spend with the student is a statement of your interest and concern. Interactions that are effective during this stage are open-ended questions, reflective-listening, and closed-ended questions that probe for deeper understanding without building barriers. What behavioral theory correlates to the causes? These interactions may not be necessary as not all students avoid talking about their problem. Still others will employ numerous strategies and a high degree of skill in hiding what they would rather avoid. There are a variety of reasons for them to do so. They may be embarrassed, feel guilty, don't want to be wrong, are afraid of other's reaction, or other reasons. Positive statements are used to keep the conversation going. To make a positive statement doesn't mean that you agree with what the student has said or done. It is simply information stated in a positive manner to probe for additional information or encourage a student to share information that s/he has been hiding. Reassuring, praise and encouragement are also appropriate. A contradictory statement works in the same manner only where a positive statement is like catching flies with honey the contradictory statement may be interpreted as honey or a jolt of reality. In either case they can be effective to get students to talk about something they have been hiding or unwilling to discuss. Who owns the problem? Making students aware who is experiencing the concrete effects of the problem and who is not. Allowing them to disassociate from it. Roadblocks that interfere with communicating problem ownership. How roadblocks cause students to feel and experience frustration, anger, defensiveness, embarrassment, and lower self-esteem that create increased resistance to change. Once a situation or problem is identified, and the student accepts the problem, the student must want to change. 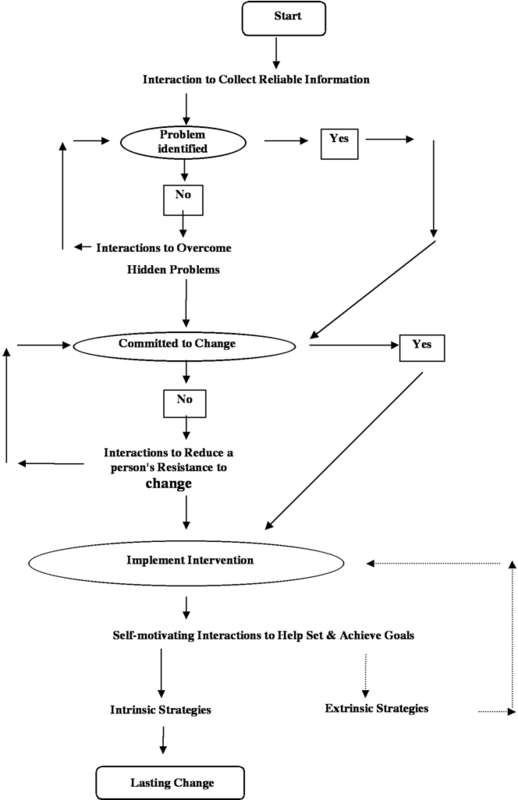 If the student is willing to make a sincere commitment to change, the next step is to select an intervention that is the least restrictive and intrinsic (see intervention continuum for interventions listed from least restrictive and intrinsic to most restrictive and extrinsic) is selected. If the student does not commit to change, then the conversation moves to interactions that reduce a person's resistance to change. Interaction for this step is a closed question. The types of interactions used to reduce a person's resistance to change so that s/he are willing to accept suggestions for a plan or create a plan, implement the plan, and adjust it as necessary to achieve lasting change fall into two categories. First, is conversational interactions to support change interventions when students are intrinsic motivated. Second, is conversational interactions to support change interventions when students are not intrinsically motivated and extrinsic motivation is used as part of an intervention. Each of these have different kinds of conversational interactions to accompany the chosen interventions. Two paths in the Conversational Interaction diagram represent these interactions: left path, solid arrows, represents extrinsic interventions and the right, dotted path, represents intrinsic interventions. The right, intrinsic and less restrictive interventions will use more open-ended, reflective listening, empathy, support and more, and encouragement statements. The left, extrinsic and more restrictive interventions will use more approval, authority, disapproval, I-statements, and praise. However, an extrinsic and more restrictive approach does not need to be limited to these interactions and interventions only. Whatever kind of interventions used the more caring the tone of the conversation the greater the possibility of lasting change. Therefore, if an intervention starts restrictive and extrinsic, there must be a transition to intrinsic and less restrictive for there to be a possibility of lasting change. A student wants to be able to interact with his or her peers in a manner that allows him or her to be accepted. The student has the desire but is lacking necessary knowledge and social skills. It is highly likely that a teacher or counselor can work with this student and help them achieve the expected goal. A student refuses to complete work in a timely manner and is not willing to change. For one reason or another the student lacks intrinsic motivation. After sufficient failed conversations to elicit a commitment to change the teacher uses an authority statement to tell the student what they should do and implements an intervention of reward and response cost or punishment to create change. While the intrinsic approach is more acceptable this may be an example when a more restrictive extrinsic approach is necessary. Each of these examples has different kinds of conversational interactions to elicit a commitment to change. The first, intrinsic and less restrictive approach used more open-ended, reflective listening, empathy, support and more, and encouragement statements. The second, extrinsic and more restrictive approach will use more approval, authority, disapproval, I-statements, and praise. The more directed, coercive, and authoritarian the approach the more likely the interactions will be concentrated around the later kinds of statements. However, an extrinsic and restrictive approach does not need to be limited to those interactions only. The more interactions and interventions used that are less restrictive and more intrinsic, the more caring the tone of the conversation and the greater the possibility of obtaining a commitment to change, if not at first, later. Therefore, conversations and interventions that start extrinsic and restricted must transition to intrinsic and less restrictive to increase the possibility of lasting change. Approval statements - Should approve of the qualities or behaviors the person values. Be vary careful to communicate to the student a distinction between qualities and behaviors and the student them self. Authority Statements suggest to students what behaviors you disapprove of. However, they can be used when you disapprove of something the student does. Tell them you disapprove of their action(s) and give a rationale for it. An I-Statement might be appropriate. Make sure the student is aware that you disapprove of what the student did not the student themselves. Disapproval statements can usually be avoided, as students usually know what you approve of and do not. However, if you feel it necessary, then using an I statement might be more appropriate.